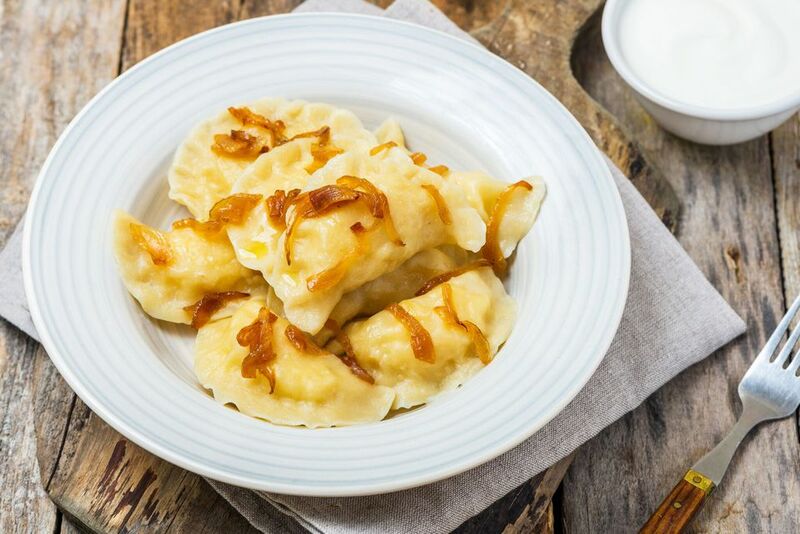 This Polish potato pierogi recipe or pierogi ruskie (pyeh-RROH-ghee RROOSS-kyeh) is from chef Marek (Mark) Widomski, founder, and director of the Culinary Institute in Cracow, Poland. Pierogi ruskie are among the most popular types of Polish dumplings. Contrary to what most people believe, that does not translate to "Russian pierogi." It actually means Ruthenian or Rusyn pierogi. Chef Mark and his staff offer classes in everything from peasant food to gourmet cuisine, tailoring them to the individual's needs, in Polish, English, and other languages. For best results, don't mash the potatoes, use a fork or grinder, according to chef Mark. Peel potatoes and fork blend or rice them (do not mash). Mix with sautéed onion and farmer's cheese. Season to taste and set aside. Place 2 cups flour in a large bowl or on a work surface and make a well in the center. Break the egg into it, then add the salt and a little lukewarm water at a time. Bring the dough together, kneading well and adding more flour or water as necessary. Divide the dough in half and cover it with a bowl or towel. Let it rest 20 minutes. On a floured work surface, roll the dough out thinly and cut with a 2-inch round or glass. Spoon a portion of the filling into the middle of each circle. Gather scraps, re-roll and fill. Repeat with remaining half of dough. Bring a large, low saucepan of salted water to boil. Drop in the pierogi about six at a time. Return to the boil and reduce heat. When the pierogi rise to the surface, continue to simmer a few minutes more. Remove one with a slotted spoon and taste for doneness. When satisfied, remove remaining pierogi with a slotted spoon to a serving platter. Serve warm with caramelized onions or skwarki (pork cracklings) or fried bacon pieces, and a dollop of sour cream, if desired. For best results, according to chef Mark, some small pieces of the whole potato should remain.